It amazes me to see so many people who don't actually include an email signature with their emails. This is a HUGE missed opportunity for business. A little email signature hack that I don't see many people doing but is totally a ninja-tactic to generating more buzz and business is to turn your email signature into a silent sales machine. That's an offer right at the bottom of my email. So each and every message I send out silently makes this offer to every person I'm in contact with(and that's a lot of people). So what can you do to spruce up your signature and maybe even include your own silent sales machine message? What kind of low cost-high perceived value offer can your come up with to get people curious enough to check out your website and maybe just maybe even take you up on your offer? What's even more amazing to me is that there's no mention of a business website let alone a silent sales machine offer. 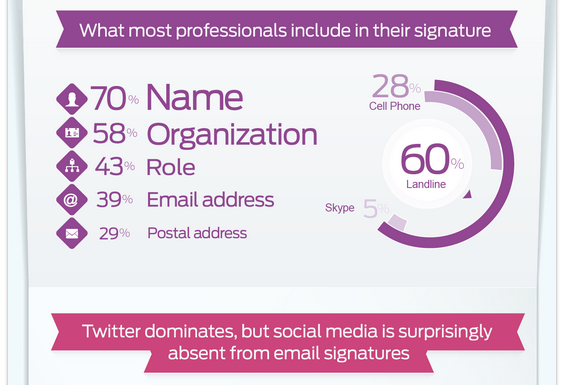 These amazing an interesting stats came from the infographic, "Anatomy of an Email Signature" but together by WriteThat.Name.